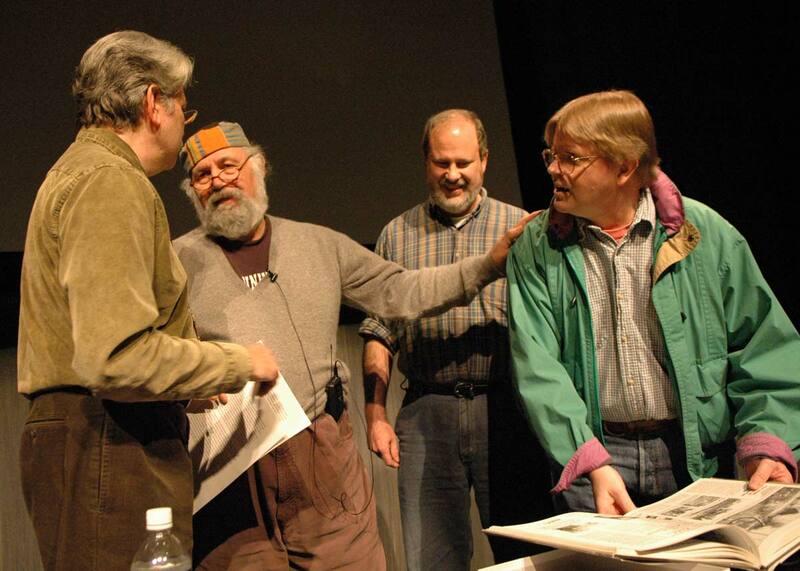 When our good friend Clay Eals decided that with a little help from some other friends – well folk – Seattle’s part in Pete Seeger’s nation-wide 90th birthday party could be celebrated at West Seattle’s Admiral Theatre he had reasons to feel confident. First his acclaimed big biography Facing the Music (now into its second printing) of folksinger Steve Goodman was issued in 2007 and ever since Clay has been traveling the county sharing the stories he gathered and polished accompanied by musicians in the cities he has visited who also loved celebrating and singing Goodman’s songs. That then is reason one – Clay has been doing concerts steadily. Second – and here we will with some shame use for the first time a by now tired but still woefully current expression and also pledge to then abandon it – Clay is truly a West Seattle icon. More to the point of the Portola and Admiral Theatres, it was as president of the Seattle Historical Society in 1989 that Clay led the successful citizen action to save the Admiral. And before that as editor of the West Seattle Herald, Clay edited and published in 1986-87 West Side Story, the oversized history of his extended neighborhood. Again, he did it with the help of many folks and friends, because he knows them and has many. Clay is one of the easiest persons to work with and/or just be around. But it was during these fateful years – 86-87 – that something bad happened in the editor’s office. Clay made a mistake. How did we uncover this all-to-human quality in Mr. Eals? Years ago in celebration of Clay’s efforts in saving the Admiral, I wrote a “now-and-then” about it for Pacific Northwest Magazine. With Clay’s Pete Seeger party we revived it on this blog, and also put in additional pictures that never made it into the paper. (Pulp is costly.) We posted all that here on May 5th last. Soon after the Seeger concert and that blog-work I remembered a photo the West Seattle Historical Society had shared with me earlier. 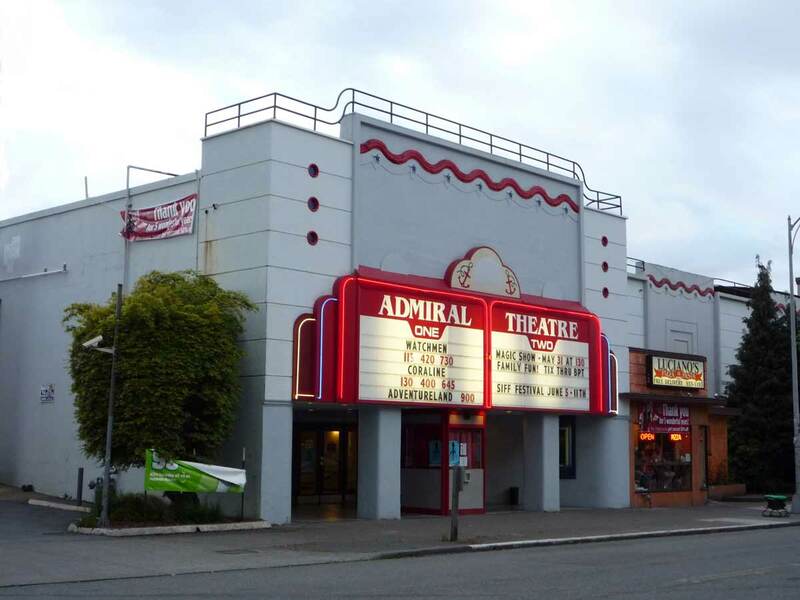 It was of a theatre that, it claimed, was the predecessor of the Admiral, and even more. It was still there – in the Admiral. The old Portola had been transformed into the Admiral’s lobby. Since once can add anything relevant to one’s blog whenever, I thought to join the Portola picture to our story. But to make certain that it was what is claimed, I also thought it wise to ask some questions, especially of local theatre historian David Jeffers who is often helpful with these puzzles. Next, David joined Jean, and Clay and me in an e-mail conversation. Now we may with compassion describe Clay’s not-so-fateful error. The Portola-Admiral story (and mistake) is told on pages 213-214 in West Side Story. We have attached the relevant parts here. The older of the two pictures identified as the Portola appears first above, on page 213. 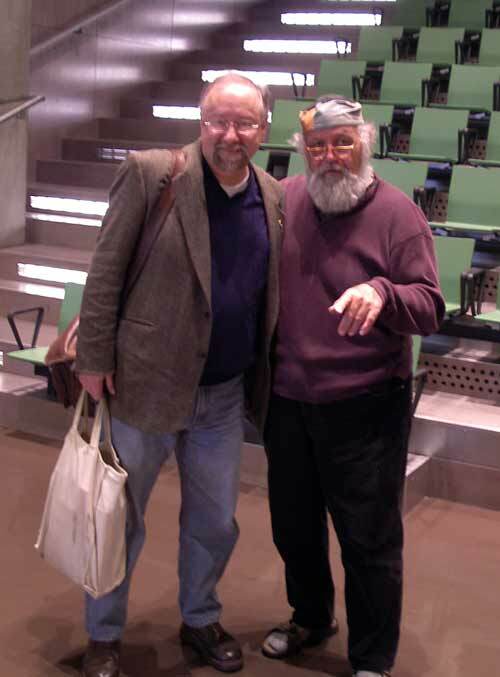 David Jeffers visits with the editor following a Seattle Public Library lecture in 2007. Come now David Jeffers describing how he demystified the impaired caption on the backside of what we will call the “Lucille print.” He did it by establishing that Portola #2 and the questioned Lucille’s Portola #1 were two buildings and far apart. The editor will make only the tinyest of changes to David’s often philosophical description. It is a revealing testament to an inquiring mind. “Much of our history is forgotten, not lost, and only awaits re-discovery. Seattle reads more books and sees more movies than average America, and this is not a recent development. Just as every neighborhood has a branch of the Public Library, in the years before television they all had a movie house, typically within easy walking distance. One of these forgotten theaters stood on the Northwest corner of Queen Anne Avenue North and West Boston Street. The Queen Anne Theatre opened for business in 1912 and closed, as did many, with the advent of sound. City directories and insurance maps confirm this information. Tax records list a build date of 1911 for the structure located at 2201 Queen Anne Avenue North; they also include a WPA (Works Progress Administration) era photo (post-theater) from the nineteen-thirties and indicate the brick and mortar structure survives today, an example of adaptive reuse. [The editor suggests a visit to Google Earth to fine what holds that Queen Anne corner now.] As with many of Seattle’s neighborhood theaters from the silent era, this is all the documentation my research has found. I have surveyed the site, but had never seen a photograph of The Queen Anne Theatre as such, until recently. Tax cards like this one can be had for most structures in King County built before 1937. With tax number or legal description in hand, contact Greg Lange (another sometime contributor to this page) at the Washington State Archive in Bellevue at 425-564-3942 to order photographic prints of structures of interest and/or their tax cards – like this one. The prices are not gouging, and once you have your print in hand or on platen it is permitted to Photoshop away the white writing. Another insertion of the shamed Portola above and the tax photo for 2201 Queen Anne Avenue, top. As a devoted reader of Now and Then, I look forward to my weekly dose of urban archeology on the back page of Pacific Northwest Magazine. More recently, I’ve also become a follower of this web site, in part an interesting and informative elaboration of Paul’s column. Whenever the subject strays anywhere near silent era movies, my particular area of interest, like a dog chasing a fire truck, I’m compelled to throw in my two cents. Paul, West Seattle’s Log House Museum, Clay and (bless his heart) Pete Seeger, all deserve credit for this new discovery. 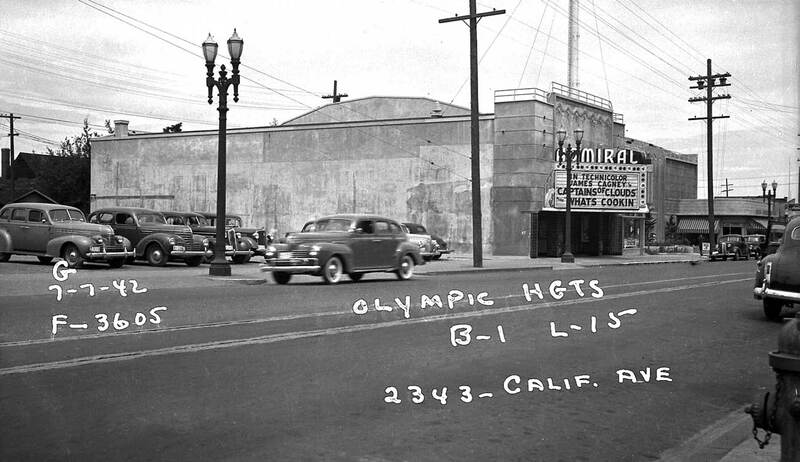 The oldest photograph of West Seattle’s Portola Theater I know comes from UW Digital Collections and is dated 1930. [Again, see page 214 above.] 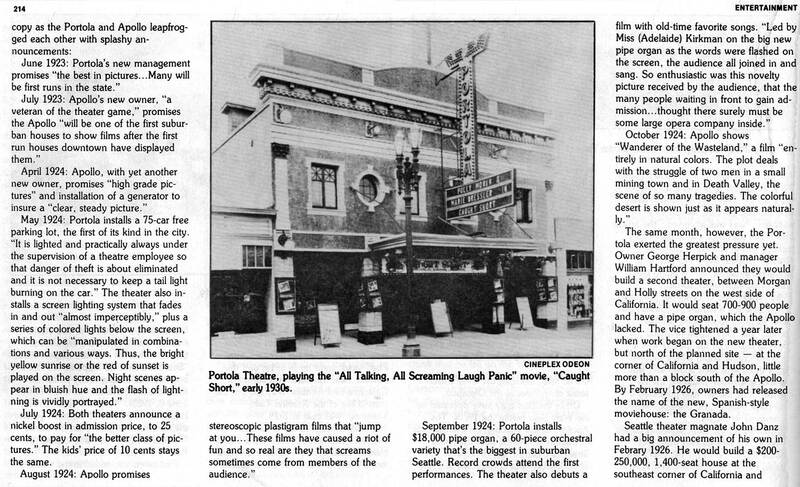 I provided a link to that online image, posted with my comment to Paul’s Admiral Theater piece from May 5, “A Bonus Seattle Now & Then: We Shall Overcome…” Later that week, Paul sent me the image of a theater with no marquee, purported to be The Admiral’s predecessor, The Portola (ca.1919). I had previously seen a tiny example of this photo on The Puget Sound Theater Organ Society web site and have since learned it was published in West Side Story, a history of West Seattle, in 1987. Significant differences in the 1919 and 1930 images immediately drew my attention. The older photo offers a host of clues, including movie posters and an adjacent business. Anne of Green Gables (1919) starring Mary Miles Minter is clearly identified in the largest poster. The American Film Institute online Silent Film Catalog lists the release date for Anne of Green Gables as November 23, 1919. The business name ” C. P. Martinez” appears to the right of the theater entrance. 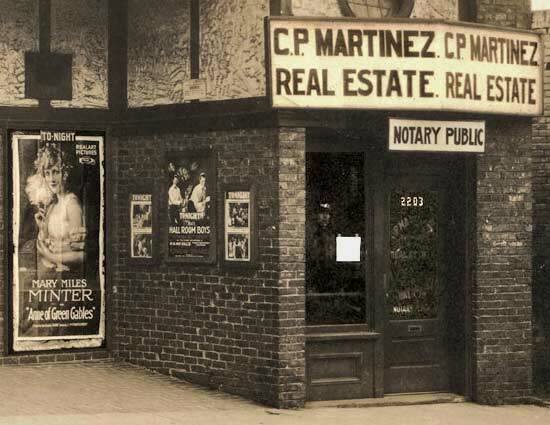 Polk’s City of Seattle Directory shows listings for C. P. Martinez, ” Real Estate, Rentals, Insurance and Mortgage Loans, Notary Public 2203 Queen Anne Av” from 1915 through 1944. This was Martinez’ only directory listing found in those editions and his street address is clearly visible in the original 1919 photo. [Seen in detail near the bottom of this post.] The Queen Anne, or Queen Anne and Boston Theatre at 2201 Queen Anne Avenue North were listed in Polk’s from 1912 to 1927. 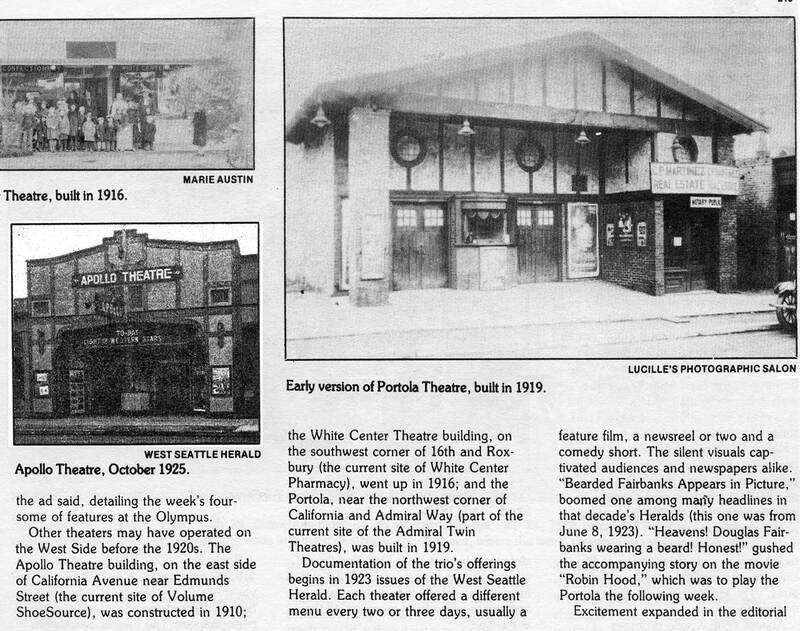 The first listing for West Seattle’s Portola Theatre located at 2343 California Avenue was in 1920. A recent survey of The Admiral Theater revealed a rear wall [above], which appears to be reinforced concrete with pour lines showing an older form construction using wooden planks. 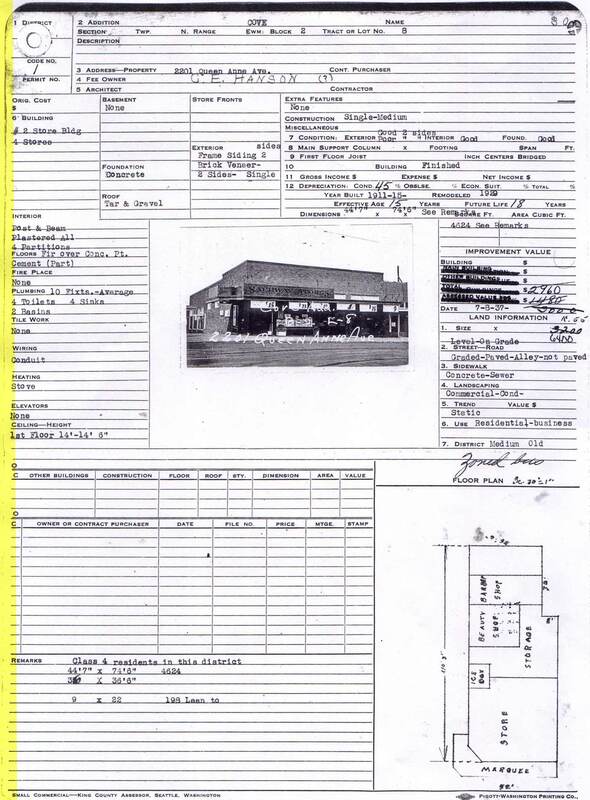 Tax records show a build date for The Admiral of 1942, which seems to indicate The Portola was demolished entirely. No written record should be taken as gospel however, and certainly there are folks living in the neighborhood that witnessed the construction/remodel in 1941. Local theater owner John Danz purchased the theater, added the present-day auditorium and reopened in 1942. Based on my research I believe the shell of The Portola survives today as the lobby and entrance of The Admiral. A comparison of these images, the 1930 Portola, The Admiral today, the 1919 photo and the 1937 tax photo of 2201 Queen Avenue North reveal similarities in placement, construction and dimensions, confirming their identity. Admiral Theatre from 1942 Tax Photo. Finally, how was this 1919 photo misidentified? A series of well-intended assumptions, ownership of the 1919 photo, a lack of architectural familiarity and supporting research are easy answers. Portholes were a commonly used element in theater architecture of the day. Numerous Seattle theaters included them as second story mezzanine, office or projection room windows in their design. They are clearly seen in the photo. While their etymology is unrelated, porthole and Portola (a proper noun) sound quite similar. A list of suburban theater advertisements including Anne of Green Gables at The Portola was published on March 11, 1920 in the Seattle Daily Times. This indicates the film was shown on that date in that theater. The Queen Anne likely screened the same print before or after and did not advertise. Neighborhood theaters drew most of their business from moviegoers who passed by daily or saw “coming attraction” announcements at earlier shows. Someone undoubtedly found the same advertisement, which led to a persuasive misidentification of the photo. “I See Dead Theaters.” A part of our cultural history, neighborhood theaters have come and gone. Many survive in anonymity today, waiting to be rediscovered. A favorite example is 615-617 South Jackson Street. Volume 1 of the 1916 Sanborn Digital Atlas, available through ProQuest on the Seattle Public Library web site, identifies the northwest corner of the Bush Hotel, built in 1915 as ” Moving Pictures “. Located in the International District, this theater may have existed only briefly and may not have advertised in English language newspapers. 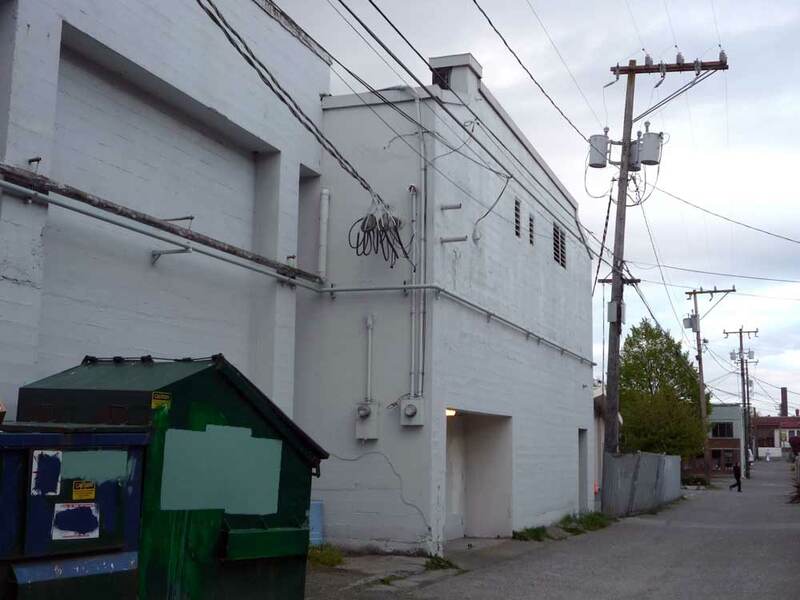 Another is The Mission Theater, located at 1412-1414 4th Avenue, from 1914 to 1920. Who would suspect a stand-alone theater with a facade designed to resemble an Old Spanish mission ever existed on the east side of 4th Avenue between Pike and Union? The Mission advertised heavily and a single head-on photo was published when the theater opened, but I’ve never come across any image showing this theater in context with the neighborhood. Yes, Clay is swell to be around. Clay Eals on the right with an open copy of the West Side Story. He shares the stage with three commonplaces of Seattle heritage. The moment I realized we’d discovered something previously unknown was tremendously exciting. I wonder if anyone in the Queen Anne area is familiar with this photo? I was far less concerned with the earlier misidentification and really considered it a secondary product of my research. Lord knows, I make more than my share of mistakes! Clay’s observations after viewing the high-resolution image spurred me on to some further digging. The two smaller posters appear to be for serials. On the right, H.A MacGill’S The Hall Room Boys in Nothing But Nerve and under the ticket window, Fender of Flesh, episode 10 of 15 from Cyrus Townsend Brady’s western, The Invisible Hand, featuring Antonio Moreno. I hadn’t seen this photo of the old Queen Anne Theater before, but it definitely confirms a photo we do have. 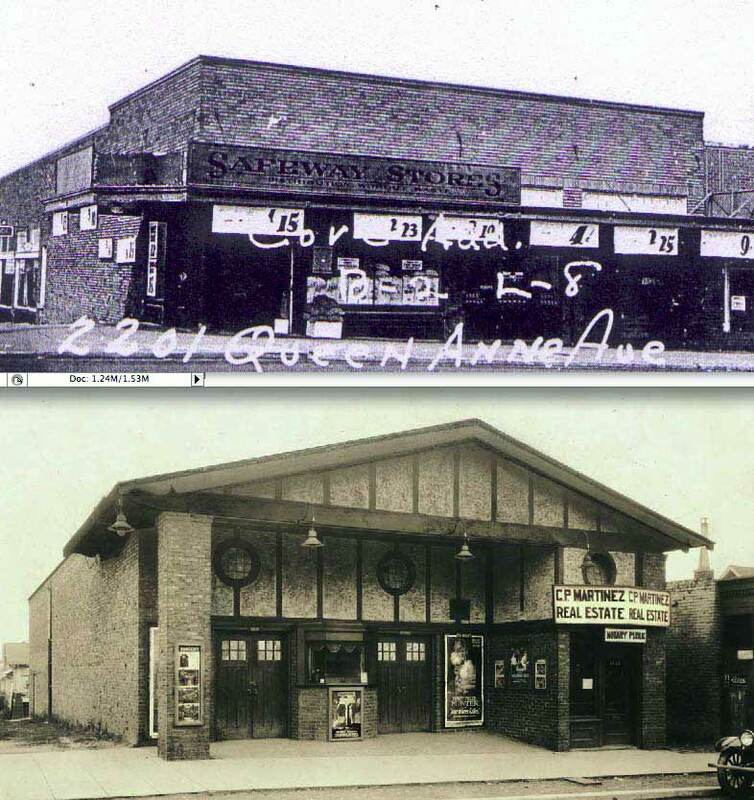 There are two references to the theater on the QAHistory website–one is an article that talks to the tearing-down of the building in 1929, and the other is a small photo of the old building reproduced for an anniversary issue of the Queen Anne News. Interestingly, the small photo is not the same as the one in this article. Thanks for the links Hilltopper. Minus C.P. Martinez’ sign, the photo might have been taken before he moved in that year. Beyond this newspaper article, is there any other documentation to support demolition of this building in 1929? The King County Assessor’s property records list a build date of the existing structure as 1911. State records also failed to show a ” void ” or demolition date. Having examined the current building I believed what stands today is an example of adaptive reuse. The 1930 tax photo also bears significant similarities to the 1919 theater photo. Of course, as I’ve explained previously, tax records can be wrong, but the builder may have used the shell of the theater and demolished the rest. Photos of the theater, later retail store building and neighborhood looking north from the other side of Boston Street might be helpful in this case. Speaking of the nearly forgotten, I wonder if anyone will recall the other Queen Anne movie theater (not the Cheerio) that existed around the same time? A hint, it was located about five blocks from the Queen Anne Theatre.